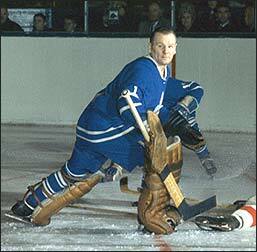 After 11 years of woe in Toronto, the arrival of Johnny Bower helped turn around the franchise's fortunes. 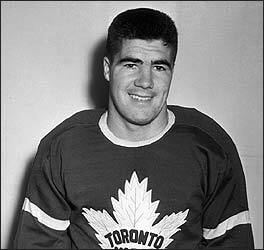 In 1961-62, Bower and the Maple Leafs won the first of four Stanley Cup championships they would claim that decade. "When we won in 1962, wow, that was a great feeling," recalls Johnny Bower. "I was probably the oldest goalkeeper to win his first Stanley Cup. That was a dream come true, a childhood dream to have my name engraved on the Stanley Cup. It was a dream I never thought would come true, to be on a Stanley Cup team." It had been quite a series. 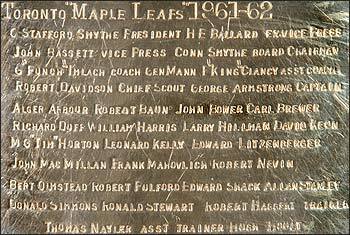 The 1962 Stanley Cup final pitted the Toronto Maple Leafs against the reigning champions, the Chicago Black Hawks. In Game 1, Chicago's Golden Jet, Bobby Hull, opened the scoring on a powerplay but Toronto rebounded and won 4-1. The Maple Leafs edged the Hawks 3-2 in Game 2. Not to be pinned to the mat, the Black Hawks blanked Toronto 3-0 in Game 3. But Game 4 posed a challenge for the Leafs. Down 2-0, at the 14:40 mark of the first period, Johnny Bower pulled his groin muscle and was replaced by back-up netminder Don Simmons. Rallying in front of their cold goalie, Toronto popped a goal late in the first but went on to a 4-1 loss and the series tied at two games apiece. In 552 NHL contests, Johnny won 250, tied 90 and lost just 195. He collected 37 shutouts along the way and was inducted into the Hockey Hall of Fame in 1976. "I was out for the series and it was up to Donnie Simmons, my back-up, to carry the load," remembered Bower. "A lot of goalies, me included, find it difficult to come in cold like that, but Simmons, he didn't mind being a second goaltender. It was tough for a goaltender to go in after sitting on the bench and have everyone expect miracles from you but when Donnie's time came to play, he was always prepared to go in." Game 5 was a shooting gallery for the goalies with the Maple Leafs coming out on top of an 8-4 decision. Bob Pulford scored a hat-trick to pace the victors. In Chicago on April 22, 1962, neither team scored in either the first or second periods. Bobby Hull put a shot past Simmons mid-way through the third but it was responded to with a goal by Bob Nevin followed by what turned out to be the Stanley Cup winner from Dickie Duff on the powerplay at 14:14. The Toronto Maple Leafs had won the Stanley Cup! They had beaten the existing champions! Although not able to contribute in the last few games, Johnny Bower was an avid cheerleader and finally fulfilled his hockey dream. 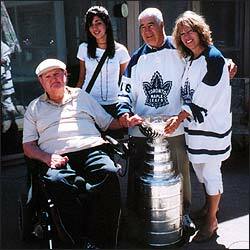 On Thursday, August 25 at 11 AM, Johnny Bower picked up the Stanley Cup once again. As a four-time winner, Johnny's childhood dreams of winning hockey's top prize were realized (1962, 1963, 1964 and 1967) but the child-like smile still creased Johnny's 80-year-old lips as the Cup was handed to him at King's Riding Golf Course in Aurora, Ontario. The Stanley Cup was placed at the entrance to the clubhouse. Each golfer got his or her photograph taken with the Stanley Cup. The picture was then inserted into a frame with the date, course name and was personally autographed by Johnny. Later in the day, each participant picked up their marvelous souvenir. Johnny went off and golfed with Ron Ellis, his teammate with the Maple Leafs. The two are great friends — Ron credits Johnny and his wife Nancy with helping him adjust to NHL life when he joined the team as an 18-year-old in 1964. Other celebrities on the Aurora course included former Leafs Wendel Clark, Brian Conacher and Rene Robert, jockey Sandy Hawley as well as Gord Stellick and Don Landry, the morning show hosts of the FAN590, Toronto's all-sports radio station. When the tournament was over, the Stanley Cup was placed on a table by the bar. Diners enjoyed roast beef, potatoes and vegetables. While duffers devoured a scrumptious cheesecake, Bower paraded between tables wearing a Toronto Maple Leafs jersey autographed by Leafs' alumni. Participants were invited to bid on the sweater as part of an auction, and the jersey went for $1,600. Recipients of the charitable proceeds included the Jennifer Ashleigh Foundation, the Good Shepherd Ministries, Peel Partners, the York Central Hospital Foundations and the ALS/SLA. "Hey Johnny," someone hollered from the crowd. "Point to your name on the Cup!" "I'd love to," laughed Johnny, "But I think the Canadiens rubbed my name right off the darned thing!" Mackell collected 369 points (149 goals and 220 assists) in 665 regular season NHL games. He started as a Maple Leaf but finished his career with eight seasons as a Boston Bruin. The Stanley Cup was taken from Aurora to Whitby, Ontario the next day. Friday, August 26 was devoted to the Stanley Cup celebration of Fleming Mackell. Although born in Montreal, Fleming Mackell became part of the Toronto Maple Leafs organization in 1945 when he joined the St. Michael's Majors. 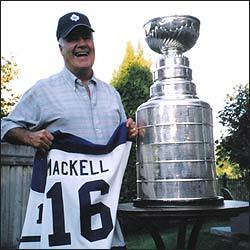 Mackell, the son of Jack Mackell who won back-to-back Stanley Cup championships with the old Ottawa Senators in 1920 and 1921, was the top point-getter during St. Mike's run to the Memorial Cup championship in 1947. 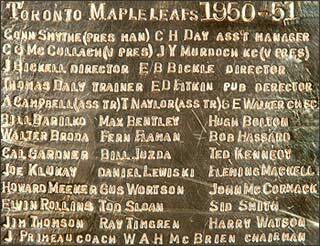 Mackell played 3 games with the Maple Leafs in 1947-48 and 11 in 1948-49, a year in which he earned the right to have his name engraved on the Stanley Cup for the first time as the Leafs won the big prize. A part-timer again in 1949-50, Fleming gained full-time status in 1950-51. As has been well-chronicled, the Toronto Maple Leafs met the Montreal Canadiens in the Stanley Cup final that year. Every single game went into overtime, and as the teams lined up for the opening faceoff on April 21, 1951, Toronto was up three games to one. Game 5 went into overtime again when, to the astonishment of all, low-scoring defenseman Bill Barilko noticed a loose puck in the faceoff circle to the right of Montreal netminder Gerry McNeil, drove in from the point and hammered a backhand over McNeil's shoulder to earn the Stanley Cup for the Toronto Maple Leafs. Fleming Mackell arranged to have the Stanley Cup show up at 9:30 on the morning of Friday, August 26 at Sir Richard W. Scott Catholic School in Markham, Ontario. There, first-time principal Kathy Hutton welcomed the Stanley Cup�as well as her father. "Dad, thank you so much for bringing the Cup to my new school," Kathy smiled. Fleming just beamed. His little girl has done well! The marquee out front read: 'Stanley Cup, 10 - 11:30 AM, Public Welcome.' Children and their parents from the neighbourhood took the opportunity to visit Lord Stanley's legacy, and Kathy got to meet many of the students who will be attending her school. A red carpet led to the school's stage, and Kathy had lined both sides with photographs of her Dad during his NHL career. Fleming was more than happy to pose for photographs with the Stanley Cup. Those staff members in the school working on their rooms were gathered around the Stanley Cup for a souvenir photo, too. At noon, Mackell took the Stanley Cup to a retirement home for Jesuit priests. Fleming wanted to visit one of his dearest friends, Father Jerry Leclair, who was now residing there. Fleming and Jerry have known each other since they were 11-years-old back in Montreal, and had played ball together. Now 76, the two old friends shared a special moment of celebration together. Fleming, his daughter and granddaughter visited lifelong friend Father Jerry Leclair at the retirement home for Jesuit priests. The Cup then was taken to his daughter Kathy's Whitby, Ontario home where, for the first hour, it sat in the front yard for neighbours to see. Afterwards, the trophy was taken into the backyard for a private dinner with family and close friends. Burgers and brauts were on the menu. One of Fleming's granddaughters was disappointed that she had to leave the party early in order to show up for her job as a hostess at East Side Mario's restaurant. After she left, Fleming suggested, "Can we take the Cup to her at work?" Why not?" Shortly after her arrival, Fleming's granddaughter was astonished but thrilled to have the Stanley Cup arrive in the arms of her Grand-Dad. Hey, Badda-boom, badda-bing! On Tuesday, the Stanley Cup Journal visits Ed Litzenberger and Pierre Pilote, teammates on the remarkable Chicago Black Hawks squad that won the Stanley Cup in 1961. Enjoy your weekend!